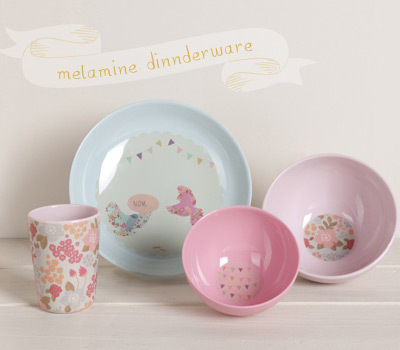 We all know the heart-sinking sound of a bowl/plate/glass smashing on the floor so for many of us with little ones, melamine dinnerware is a must-have. Australian wall decal darlings Love Mae have just released a very sweet range of children's melamine that are a far throw from your bunny/cartoon character. 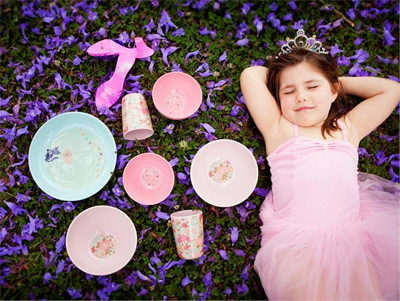 The girl's set is definitely for the little princess in your life and the boy's dinosaur set is hip and might just work with your own dinnerware. 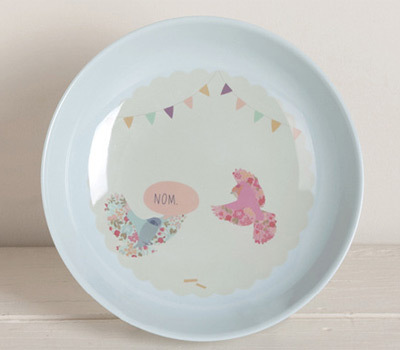 Get the kids onto the cool lexicon early with a "Nom" bird, kitty or T-Rex plate. The bowl and tumbler in each theme make a great pair and great Christening or new baby gift. 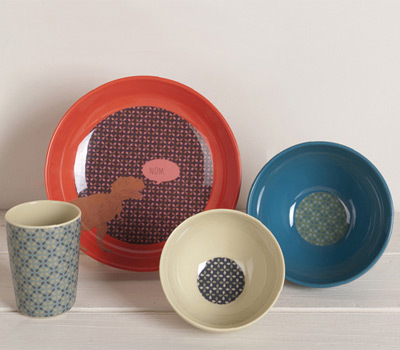 You can find Love Mae melamine dinnerware in the online store and stockists (check the website for details). Read more about Love Mae here on Bondville. Oh I love these, they are sooo pretty. And the boys' plates are just as nice. What a perfect Christmas idea. I have a drawer full of mismatched plastics from a hundred different places and I'd love to have a nice matching set like this.